Google finally embraces mobile live video streaming. Here's why the world will never be the same. Google invented live-streaming video for the masses back in 2011. It was presented as a feature of Google+, but was really all about YouTube. Called Hangouts On Air, the idea was to live-stream video with up to 10 participants. Unlike regular Hangouts, Hangouts On Air could turn a video chat into a public performance. Hangouts On Air streams could be instantly shared, meaning that you could share it while the video was in progress. After the live stream ended, the video was posted on YouTube for posterity. There was just one problem: Hangouts On Air was desktop-only, not mobile. As we learned later, the ability to live stream from a phone is the killer feature for live videos. Fast forward to last week, and Google has finally rolled out what they're calling YouTube mobile live streaming. The live-streaming feature will be built directly into the regular YouTube app. The app sounds easy to use. You'll tap on a "capture" button, optionally take a photo that will serve as a thumbnail, type in your description of the video to come, choose whether you want people chatting over your video, then start streaming. As with Hangouts On Air, YouTube mobile live-streamed videos will become regular YouTube videos in your channel. The feature was rolled out last week to only five prominent users, with Google promising a general rollout later. The late entry into mobile of the first mover on desktop for live-streaming video changes everything. It all started less than a year and a half ago with the sudden popularity of an app called Meerkat from a startup called Life On Air. Less than two months after Meerkat hit, Twitter acquired then launched a mobile live-streaming service and app called Periscope. Later, Facebook rolled out Facebook live-streaming videos for celebrities only, then to everybody. Facebook clearly sees Live Video as its opportunity to compete with YouTube. Facebook is reportedly paying some $50 million to celebrities and media organizations (such as The New York Times, CNN and BuzzFeed) to stream video via Facebook Live. Other mobile apps with the live video streaming include YouNow (which pre-dates Meerkat), AOL's Kanvas and Upclose. It's clear now that only the biggest companies can compete in this space. One year after launching, Meerkat pivoted away from one-to-many live streaming and toward few-to-few streaming (kind of like the original Google Hangouts before "Hangouts On Air," or even Skype), saying that Meerkat couldn't grow because of Periscope and Facebook -- companies with massive data and streaming capacity. The clash between Google, Facebook and Twitter will make it close to impossible for startups to compete. That competition will also fuel the next media boom. And it's going to be amazing. Mobile live video streaming has been around for a while, but Google's entry is a game-changer. Here's why: YouTube is a star machine. Felix Kjellberg, a.k.a. Pewdiepie, made $12 million last year from advertising on his videogame-centric YouTube video channel. He has 46 million subscribers. YouTube has made millionaires out of dozens of hitherto unknown people. Many YouTube obsessives are teens and children, who know YouTube stars better than they do TV stars. As the young get older, they'll bring their YouTube-viewing habits with them, squeezing out and simultaneously influencing TV even further than has already happened. Will YouTube stars embrace YouTube live mobile video? I say they won't. In fact, most of them already record from desktops, and if they wanted to stream live they could have been doing it for years. The truth is that different media favor different kinds of talent. Lucille Ball was almost unknown as a radio personality, but became a huge star when TV went mainstream. Pewdiepie could never have made it on TV, but he rules the YouTube medium. The biggest home-grown YouTube stars tend to be charismatic, hyperactive, irreverent people with editing skills who talk about video games, wacky products or beauty products in their bedrooms. YouTube favors a particular kind of editing, which, combined with goofy or outrageous commentary, makes sure that even the shortest attention span stays glued to the screen. In other words, YouTube stars have been made by a certain kind of performance and a certain kind of production. Just as a Darwinian process transformed a handful of YouTube users into mega stars, the same will happen with YouTube mobile live streaming. But YouTube's live mobile feature will usher in an entirely new kind of YouTube star. I'm sorry, Pewdiepie, but you're a washed up has-been, a media dinosaur. 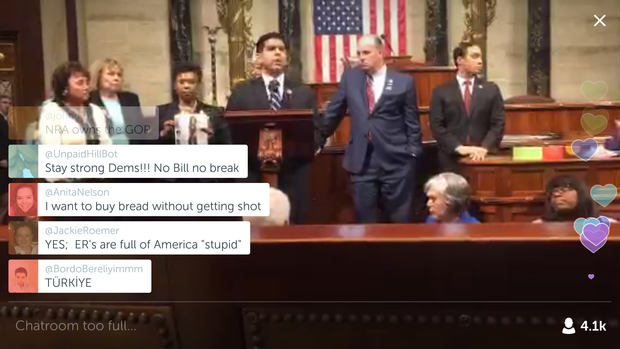 A Periscope feed of a Democrat protest in the House of Representatives on June 22, 2016. Instead of favoring canned, edited productions showing quirky personalities indoors, YouTube mobile live streaming will favor people who do interesting things or stream from interesting locations or events. Mobile phones are mobile, and the streaming audience will favor the outdoors, the historic, the controversial, the dangerous and the unexpected. Last week, Democratic lawmakers staged a sit-in on the floor of the House as a tactic to force a vote on gun control. House Speaker Paul Ryan ordered C-SPAN's feed to be shut off because Congress was not officially in session. So some members of Congress did what was impossible until recently: They live-streamed the event on Facebook Live and Periscope. Millions of people tuned in to the streams. C-SPAN picked up some of those feeds as news, rather than scheduled House coverage. My friend, the journalist and professor Jeff Jarvis, told the Washington Post that the event "showed that you don’t need government cameras and you don’t need TV networks to speak to the nation. Anyone can do it." Live mobile video streaming is already changing politics. I think it will change society, too. I believe live streaming video on YouTube, but continuing on Facebook Live and Twitter's Periscope will include protests, political events, insurrections, shootings, hostage situations and other news events. In fact, I fear that professionals will rush to the scene of news events, as in the movie Nightcrawler, including freelance war correspondents, freelance spies and freelance man-on-the-street interviewers. YouTube's entry into live mobile video streaming will accelerate the trend, create a new kind of YouTube star and change the world by making major events and crazy situations available to anyone in real time. It's an amazing world out there. And now we get to watch it all happen live.